Being makeup lover we have built an urge to try every other brand which we put eye on. In this urge we try to find ways to get those international brands which are getting popular through social media but hard to find easily. 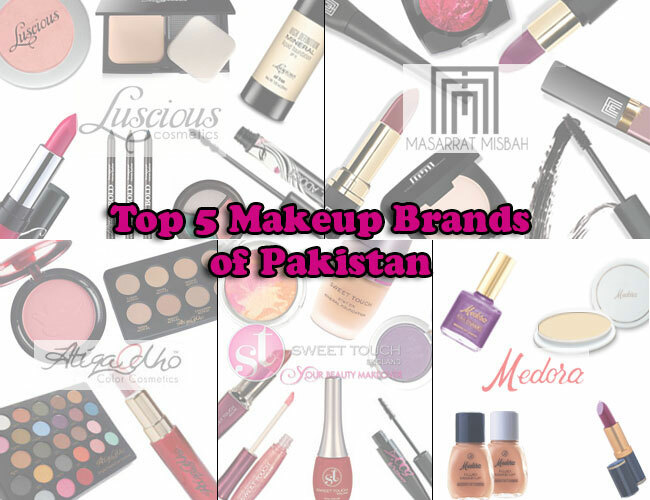 Those brands are indeed of high quality and worth trying but let me tell you we in Pakistan have some really amazing makeup brands which are not just of high quality and easily available but some of them are very budget friendly. In today's post i will be sharing these brands with you. Luscious cosmetics was founded in 2007 and since then they have become most famous brand in Pakistan and getting popular day by day even world wide. The best thing about this brand is it has wide range of products for eyes, lips, face and nails with verity of shades to choose from. The most popular products from this range is their lipsticks, eye shadows and blushers. Luscious cosmetics always come up with new products, ideas and every year introduce some thing new for their customers which make their products more interesting and eye catching. The quality of their makeup is very high with really attractive packaging making them compatible to famous brands of any other country. Their products are also cruelty free and you can buy this makeup from their official website. Masarrat Misbah has recently introduced her makeup line. She is one of the pioneers of hair and beauty industry of Pakistan and CEO and Founder of Depilex Beauty Clinic and Institute & Depilex Smile again Foundation. MM makeup is first certified halal makeup in Pakistan which makes it stand out among other brands. MM makeup includes skin, cheeks, eyes and lips products with range of shades best adapted for the Asian skin tone, climate and complexion. With only little span of time this brand has gain a renowned name because of its high quality makeup and beautiful packaging which is growing day by day. Their makeup is available on their official website. In 2001, Mehran Enterprises introduced Sweet Touch, a cosmetics brand. It have been very popular mainly for their nail polishes which have wide range of shades and different finishes. Apart from them they also offers lipsticks, lip gloss, mascara and face products. Their products are of very good quality and have beautiful packaging which comes with very reasonable price tag. The good thing about this brand, it is available very easily in all cities and every one can have access to their lovely products. Medora of London was established in 1961 which makes it the oldest makeup brand known to Pakistanis. This brand offers lipsticks, nail colors and few other face makeup but it is very popular of their lipsticks. Medora lipsticks have very large verity of shades which comes more then 3 finishes. These lipsticks have been always in fashion and trend because of their lasting power and amazing pigmentation. This brand is very very budget friendly and is easily available in whole country. What is your favorite local brand?